Georgia Groundhog Tweets, Why Don’t You? 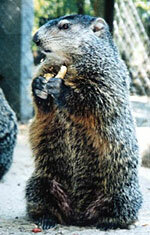 To all brand marketers who are unconvinced they should incorporate Twitter into their digital outreach, I give you the Georgia Groundhog: Gen. Beauregard Lee. The Southern rodent not only met crowds face-to-face early this morning to offer his weather prediction, he also Tweeted about his appearance. Yep, Twitter is now so prevalent, even our woodland creatures are getting into the mix. Gen. Lee’s use of Twitter has secured a great deal of media coverage, something I’m sure the folks at the Yellow River Game Ranch are really enjoying. In fact, they’ve already reported more than 8,000 new site visitors from 25 different countries as of 2:00 p.m. EST today, which they attribute to their tech savvy furry friend. And, my informal little poll shows that, so far, Gen. Lee is garnering more media coverage with this online stunt than his top prognosticating competitor, Punxsutawney Phil. As a social media advocate (and Atlanta native) I just love this!